The name 'Borderer' was dreamed up in May 1970 by the late Frank Whalley who was the publicity manager for Atkinson Vehicles. It was one of six names used by the company to identify the different models being built at the time. The range consisted of tractor units 'Borderer' (4x2) and 'Venturer' (6x4), two-axle chassis 'Raider', three-axle 'Searcher' and the four-axle 'Defender'. The new model for this generation being the twin steer tractor unit 'Leader' (6x2). "Personally i never used the name 'Borderer' always referring to them as Mark I and Mark II Atkinson tractor unit's". It was also in 1970 that Oldham-based Seddon took over the struggling Atkinson company which was based at Walton le Dale near Preston. 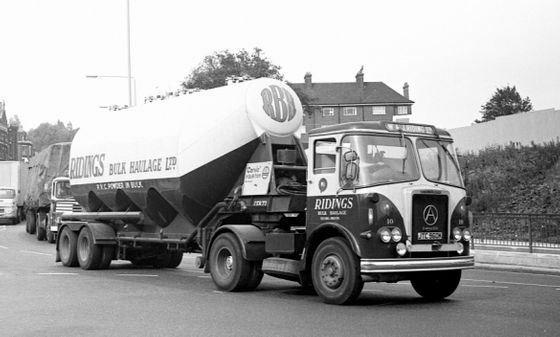 This resulted in the merger of two of the largest companies in British truck manufacturing with the reformed Seddon Atkinson company later receiving substantial backing from the American 'International Harvester' in the mutually beneficial takeover in 1974. 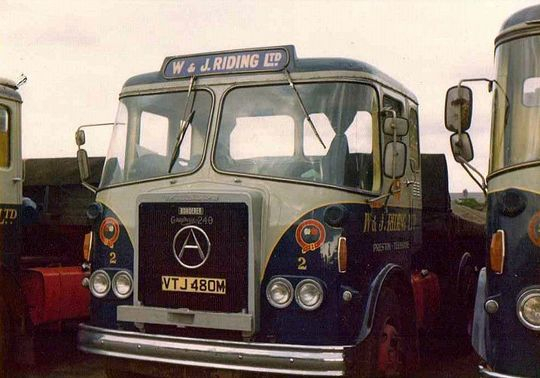 Driven from new by long time serving Riding's driver Paul Smith it is pictured above on the Atkinson Vehicles stand at the 1971 Royal Lancashire Show shortly before entering service with the fleet. After seven years service with Riding's GTD 930K was sold on to local dealer Syd Hartley in July 1978 for £500 plus vat who in turn sold it on to a fairground operator who then ran it for a further 11 years as can be in 'Life After Riding's'. Atkinson Borderer 4X2 tractor unit Reg No HTD 470K Fleet No 27 'Competent' was purchased new in September 1971 at a cost of £4,802. Powered by a Gardner 180 and driven from new by Bill Coolican it is pictured here in 1977 when six years old. 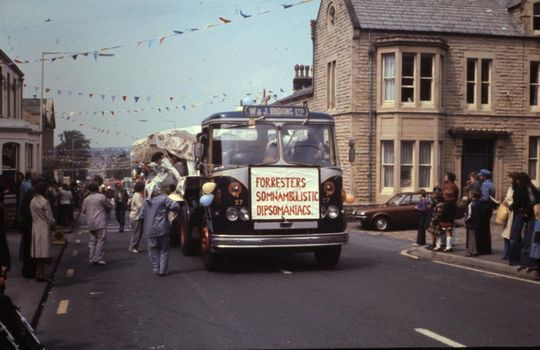 It is seen here taking part in the annual Longridge Field Day parade hauling a float on behalf of the 'Forresters Somnambulistic Dipsomaniacs', try pronouncing that after you have had a couple of pints! After being in service with Ridings for just over nine years it was sold locally on the 27th November 1980 for £700. Photograph courtesy of Jack Draper. 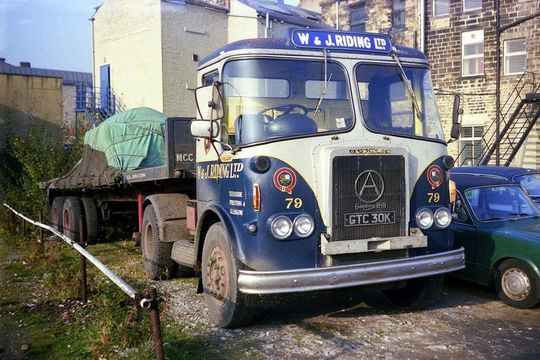 Another shot of Atkinson Borderer 4X2 tractor unit Reg No HTD 470K Fleet No 27 'Competent' which was purchased new by Riding's in September 1971 at a cost of £4,802. It is seen here parked in Keighley town centre towards the end of its working life after it had been assigned to the general haulage fleet. Notice the thick grease to protect the chrome bumper from all the salt on the roads during the winter months which was something Jim Riding always did every winter and did not remove it till the spring came. After being in service with Riding's for nine years it was sold locally on the 27th November 1980 for £700. JTC 960K Fleet No 10.
gearbox and Kirkstall rear axle. Registered new to Riding's on the 1st of November 1971, at a cost of £4,802.60p, it was driven from new by the late Richard Walton who was a lifetime Riding's driver. It is pictured above while heading down Archway Road London in October 1972 but unfortunately just under two years later, on the 25th of July 1974 while parked overnight in Larne harbour, JTC 960K was detached from its tank trailer, stolen and was never to be seen again. Photograph courtesy of Edward J Beazley. 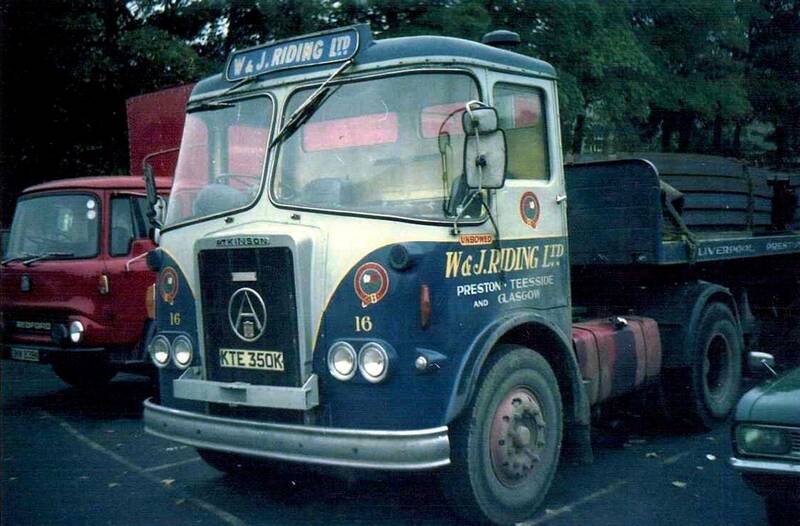 Atkinson Borderer 4X2 tractor unit Reg No JTJ 990K Fleet No 5 'Victorious' was registered new to Riding's on the 1st of December 1971 at a cost of £4,884. Powered by a Gardner 180 engine it was driven from new by Joe Masterson Jnr a lifelong Riding driver. 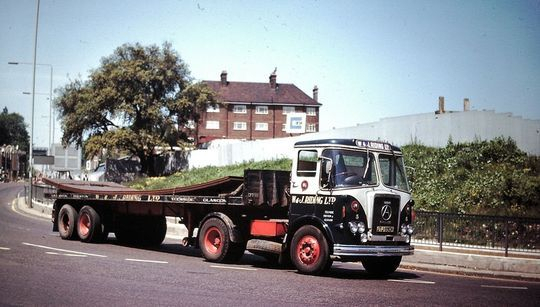 It is seen here in June 1973 on Archway Road in London with a full load of steel plates destined for Rochester Kent from the British Steel Corporation plant at Cambuslang in Scotland. This particular location was a very unusual place to find one of the general haulage fleet as it was mainly the powder tanker fleet that ventured into London. 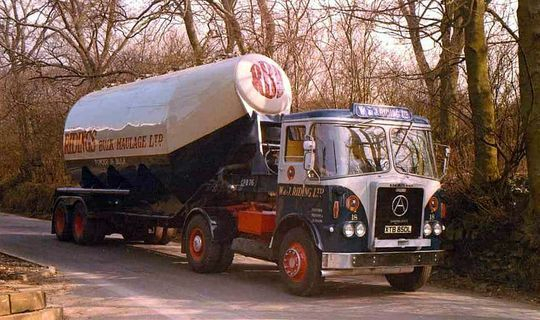 Atkinson Borderer 4X2 tractor unit Reg No AMS 113K Fleet No 33 'Invincible' was driven by Alan Margerison and is seen here coupled to a 40 foot Crane Fruehauf tandem axle trailer with a nicely loaded two drop load. 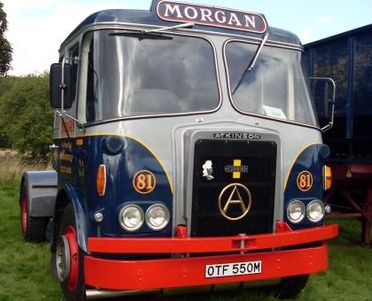 Powered by a Cummins 220 engine, in line with a Fuller 610 gearbox and group axle, it was originally registered new to TDG Group 'Monkland Motors' of Airdrie on the 4th of April 1972. 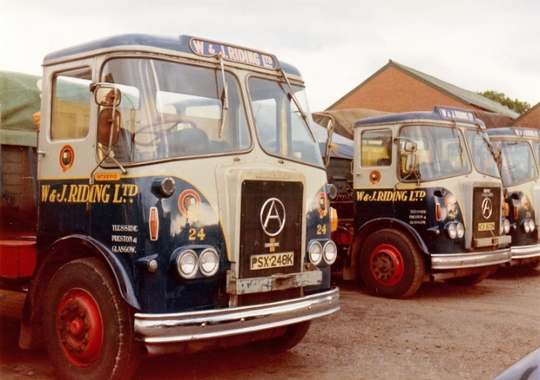 In March 1975 TDG Ltd decided to close down 'Monkland Motors' so Tom Riding travelled up to Scotland and bought all ten Atkinson Borderer's that they had been operating, which included AMS 113K. Purchased at a cost of £2,781 it was the first of the batch to be tidied up and painted in Riding livery and on leaving the paint shop Tom Riding decided to name it 'Invincibe' to restore some dignity to it and subsequently named all the other nine. After four years service with Riding's AMS 113K was sold on in February 1979 to a Mr Lewthwaite of Longton Nr Preston for the sum of £1,700 plus vat. Photograph courtesy of the Geoff Milne Collection. Atkinson Borderer 4X2 tractor unit Reg No PSK 246K Fleet No 24 'Intrepid' was powered by a Cummins 220 engine in line with a Fuller 610 gearbox and a group axle. Originally registered new on the 15th of September 1971 this was another of the ten Atkinson Borderer's that Tom Riding bought from 'Monkland Motors' with this one costing the book value of £2,781. Pictured here by Geoff Milne shortly after coming out of the paint shop it would be later brought back into the workshop for a Riding in house sleeper cab conversion. After four and a half years in the Riding fleet it was sold on to Norman Billington of Heysham for £1,450 plus vat on the 13th of July 1979. Atkinson Borderer 4X2 tractor unit Reg No YWG 496K Fleet No 52 'Valiant' was powered by a 220 Cummins engine in line with a Fuller 610 gearbox and a group axle. 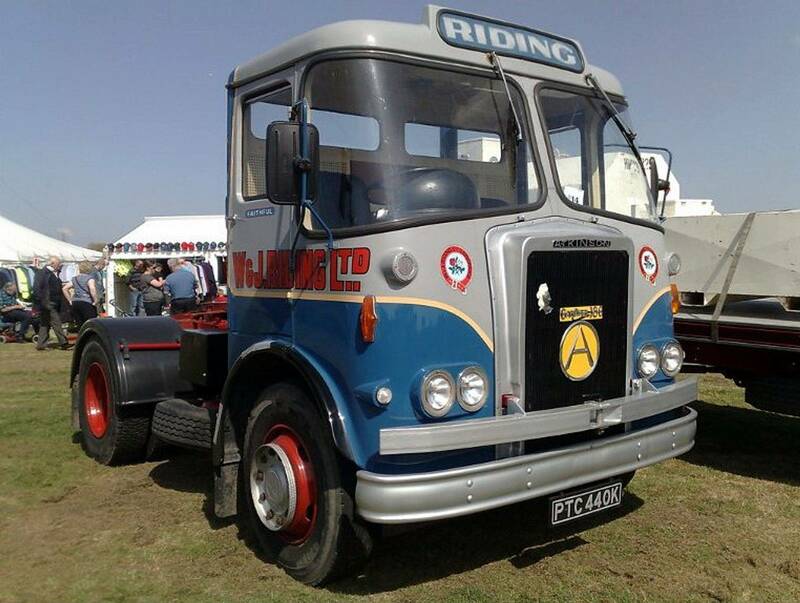 Originally registered new on the 1st of March 1972 this was another of the ten Atkinson Borderer's that Tom Riding bought from 'Monkland Motors' with this one costing £2,781. 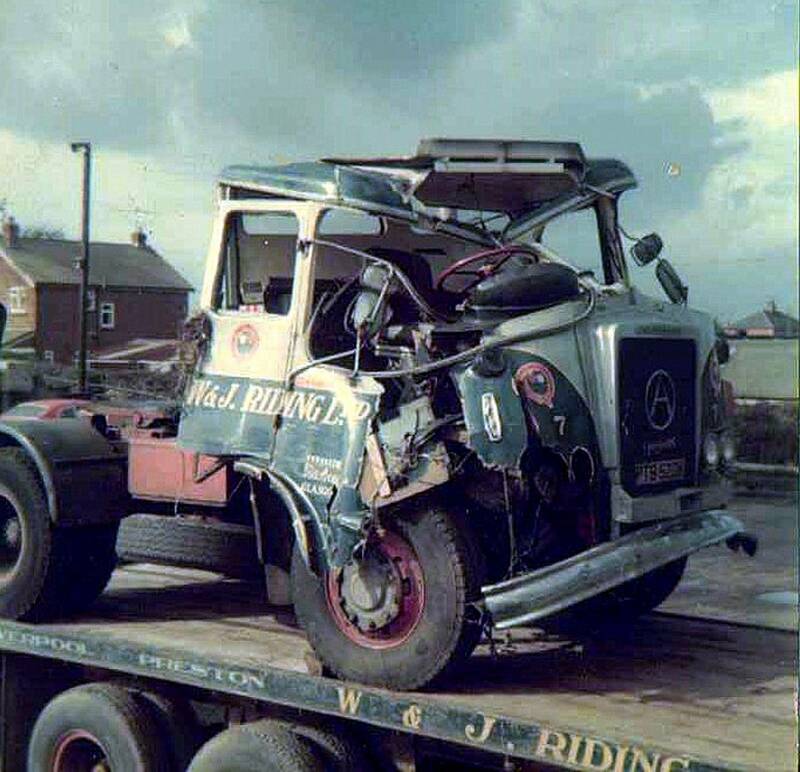 This particular tractor unit was involved in a very serious accident on the A59 just West of West Marten and was subsequently scrapped, see accidents happen section. YWG 496K is seen here in happier times with a trailer loaded with Heinz products from their Kitt Green plant near Wigan. Note the red rear mudguard, a legacy from its time north of the border with 'Monklands Transport'. Atkinson Borderer 4X2 tractor unit Reg No PTB 520K Fleet No 7 'Confident' was registered new by Riding's on the 1st of July 1972 at a cost of £5,625.57p plus vat, equivalent to about £63,000 by today's value. 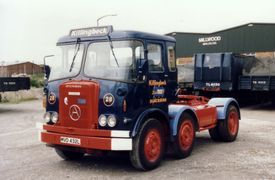 Powered by a Gardner 180 engine it was fitted with an in house sleeper cab extension and is pictured above coupled to a 40 foot tandem axle Crane Fruehauf trailer. For a while PTB 520X was used on the inter factory run between ICI Hillhouse and ICI Welwyn Garden City on stock transfer. 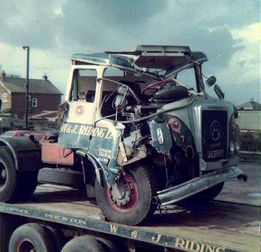 Later disaster struck when, along with it's trailer, it completely rolled over on the road between Welwyn Garden City and the M1 which was later found to be a clear case of driver error. After eight years service PTB 520X was eventually sold on in 1980 to local dealer Syd Hartley for £1,100 plus vat. 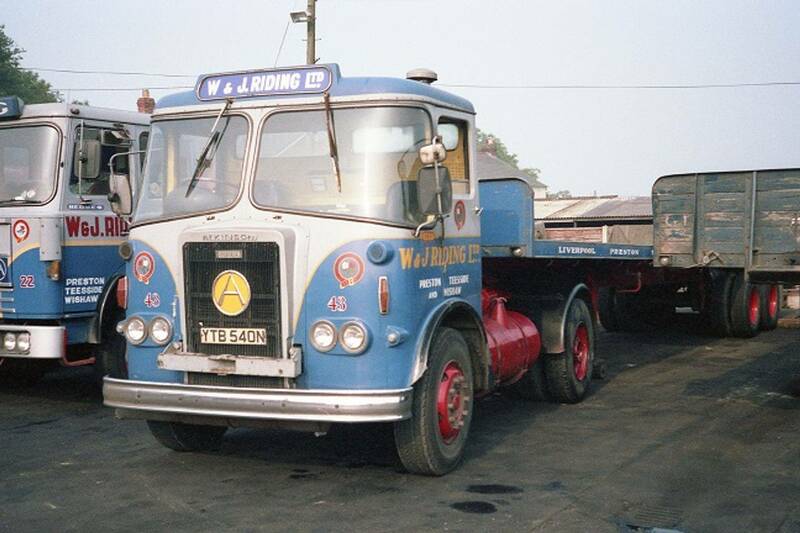 This shot of 1972 registered Atkinson Borderer 4X2 tractor unit Reg No PTC 440K Fleet No 8 'Faithful' shows it being utilised to take trailers to Kirkham test station for their annual MOT test which is were this picture was taken. After serving W & J Riding for over 20 years this particular tractor unit was fortunately saved from the blow torch and fully restored. 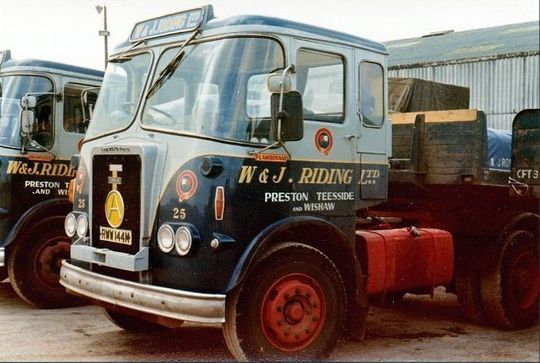 1972 registered Atkinson Borderer 4X2 tractor unit Reg No PTC 440K Fleet No 8 'Faithful' is seen here towards the end of it's working life at Riding's while being utilised as the yard shunter. Fortunately PTC 440K was later saved for preservation. Atkinson Borderer Reg No PSX 80K Fleet No No 61 'Swiftsure' is seen here sailing serenely down the main street of Skipton in the days before the by-pass. Loaded with double deck pallets of Alkathene from Wilton this unit was one of the ten purchased from Monkland Motors when they decided to close down and had originally been new to Russell of Bathgate. 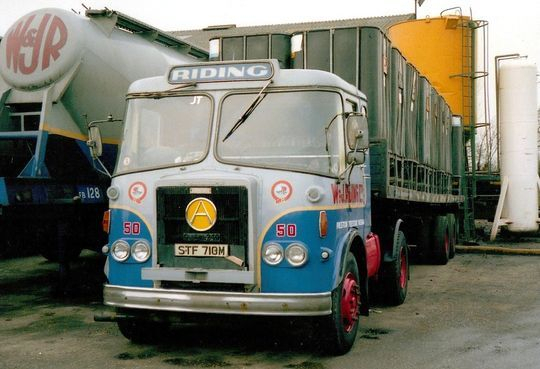 PSX 80K was the only Borderer Riding's had with a two speed axle and was fitted with Riding's trade mark in-house sleeper cab extension. It was used for a considerable time on inter factory stock movements between the ICI Hillhouse works at Blackpool and Welwyn Garden, with the high gearing good for the fuel figures. Photograph courtesy of the late Colin Wright. 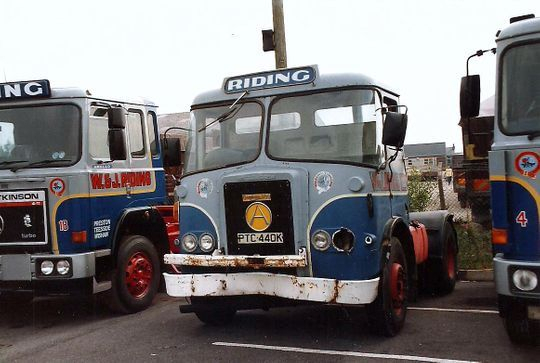 Atkinson Borderer 4x2 tractor unit Reg No KTE 350K Fleet No 16 'Unbowed' was powered by a Gardner 180 engine. 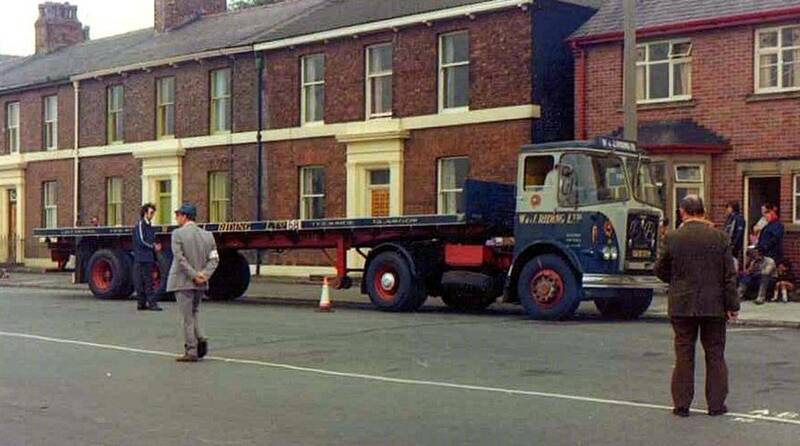 Driven from new by David Hodgson it is pictured here while coupled to a tandem axle flat trailer loaded with steel colliery arches from the North East. 1972 registered Atkinson Borderer 4X2 tractor unit Reg No GTC 30K Fleet No 79 'Faithful' was powered by a standard Gardner 180 engine. 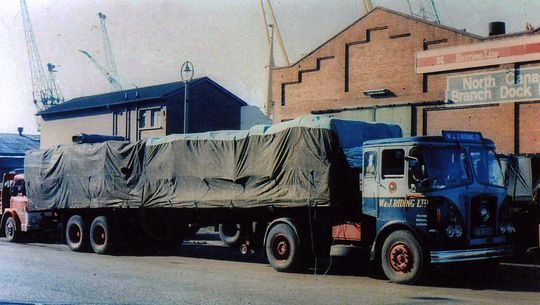 Pictured here while parked up in Keighley West Yorkshire it spent its first four years of service coupled to a Crane Fruehauf powder tank after which time it was relegated to the general haulage fleet were it is seen here coupled up to a tandem axle Municipal coil carrier. 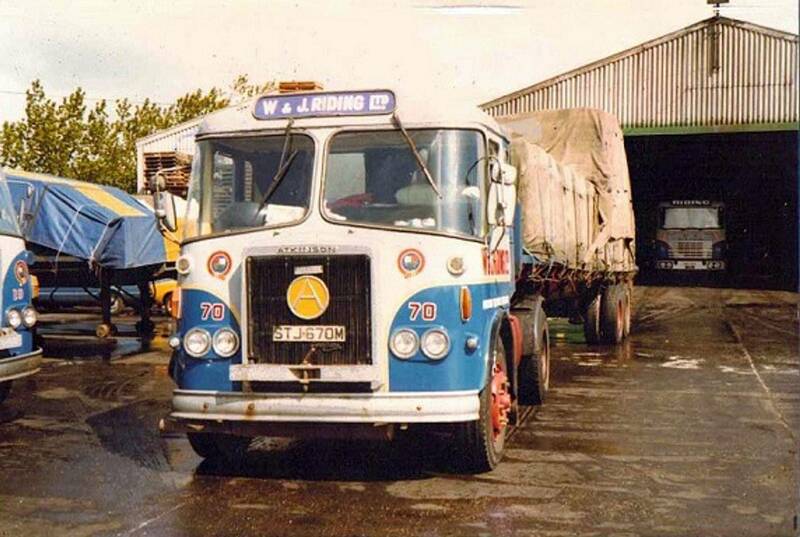 Atkinson Borderer 4x2 tractor unit Reg No STE 830L Fleet No 11 'Persistant', powered by a Gardner 180, was registered new on the 18th of September 1972. It is seen here passing through the town centre of Skipton in North Yorkshire in the days before the by-pass while hauling a trailer loaded with steel back to Longridge depot. Atkinson Borderer 4X2 tractor unit Reg No TTC 490L, registered new on the 6th of October 1972, is seen here while discharging it's load at James Hallstead's factory at Whitefield near Manchester. 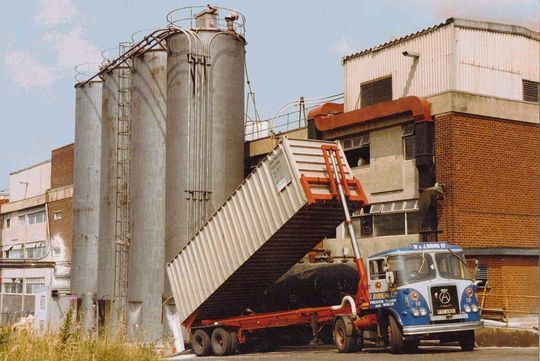 Riding's operated quite a number of these tipping skeletal trailers which were fitted with rotary feeders at the rear for discharging plastic powder and pellets from these 30 foot containers. Atkinson Borderer 4x2 tractor unit Reg No PTE 630L Fleet No 67 'Champion' was registered new on the 1st of January 1973. Powered by a Gardner 180 engine in line with a David Brown gearbox and Kirkstall BDR axle it was allocated to Tommy Lambert after it emerged from its total rebuild in the company's workshops. After the rebuild Tom Riding decided the best thing to do would be to re-register the vehicle so as to get away from its past history. 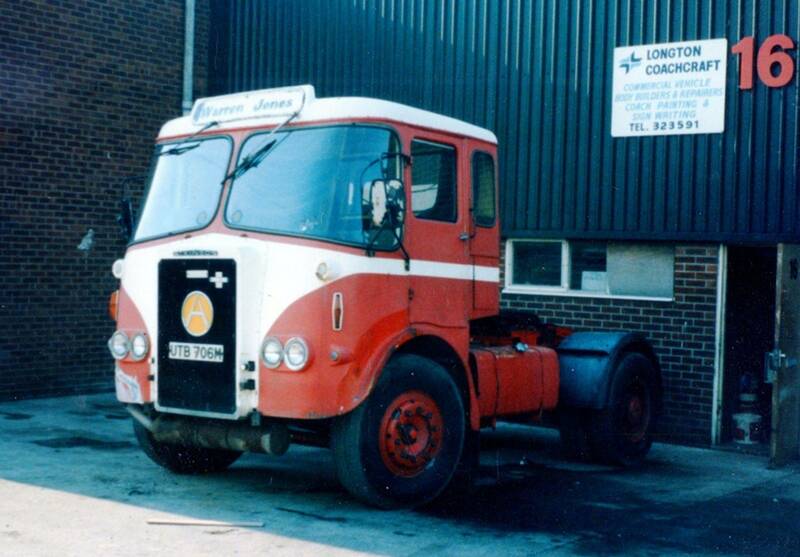 After eleven years service It was finally sold to Whitehead Transport of Padiham in January 1978 for £700 plus vat. Registered new on the 29th of March 1973 at a cost of £5,322.48p Atkinson Borderer 4x2 tractor unit Reg No XTF 970L Fleet No 29 was powered by Gardner 180 engine. 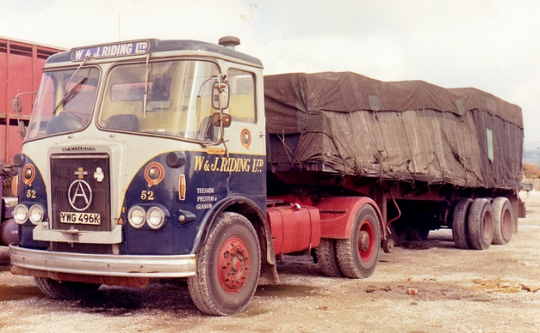 This was one of six tractor units fitted with the Gardner 180 engine and plated at 32 tons GVW. 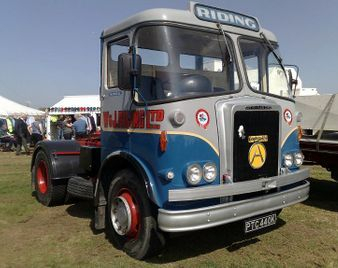 All subsequent tractor units had either the 8 cylinder Gardner or the Cummins to comply with the 6 BHP per ton legislation. Originally assigned from new to the tanker fleet it is seen here in the later stage of its life when it has been relegated to general haulage fleet with it's blowing and tipping gear removed. Pictured above coupled up to one of the company's 40 foot tandem axle trailer's with a neatly sheeted and roped load on board it had also by this time been fitted with an in house sleeper cab conversion. 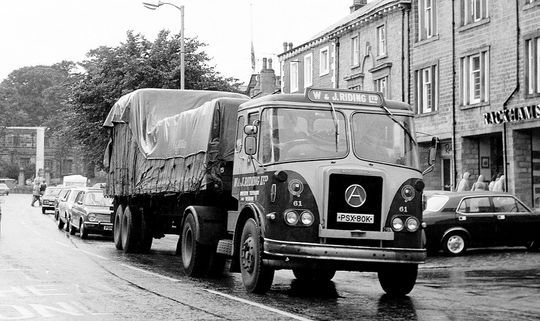 After eight years service XTF 970L was eventually sold on to a Mr J. McGarrie of New Longton Preston for £1,000 plus vat on the 28th of September 1981. Atkinson Borderer 4X2 tractor unit Reg No MVD 432L Fleet No 21 'Couragous' was powered by a Cummins 220 engine in line with a Fuller 610 gearbox and group axle. 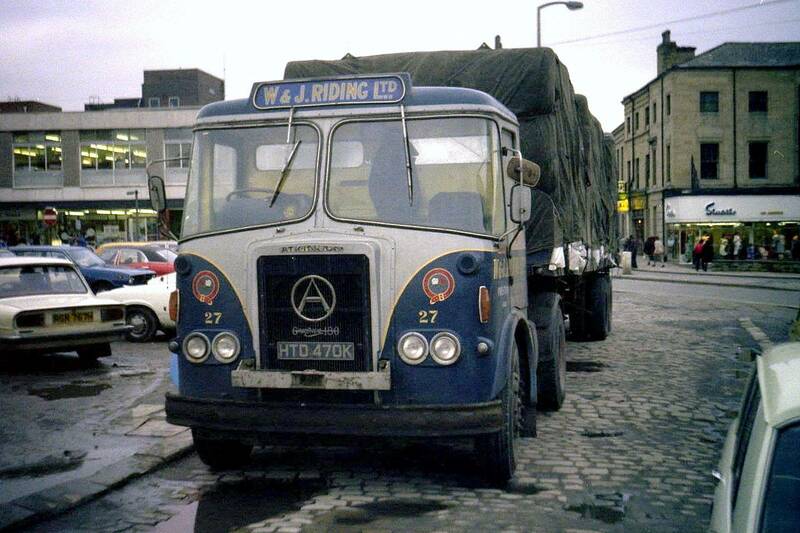 Originally registered new to TDG Group 'Monkland Motors' of Airdrie on the 1st of May 1973 it was in March 1975 that Tom Riding travelled up to Scotland and bought all ten Atkinson Borderer's that they had been operating after TDG Ltd decided to close the company down. 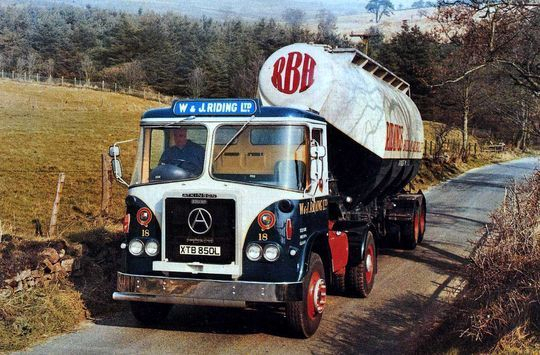 After the rebuild it was called an 'Atkinson Buccaneer', the name being chosen by life long Atkinson lorry fan the late Michael Deuchars of Edinburgh who sadly passed away on the 17th of July 2013. A nice on the road shot of Atkinson Borderer 4X2 tractor unit Reg No MVD 432L Fleet No 21 'Courageous'. 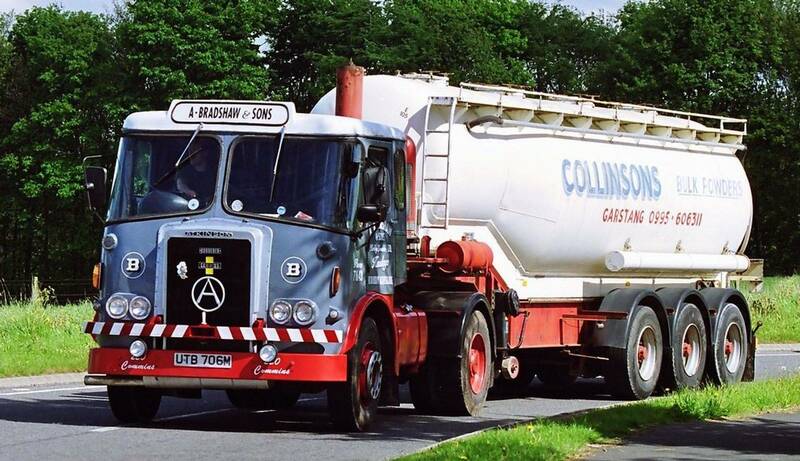 Powered by a Cummins 220 engine in line with a Fuller 610 gearbox and group axle it is pictured here in 1979 heading North on the M50 at the junction with the A417. After unloading steel plate in South Wales from Motherwell it had collected a return load of 20 tons of bagged fertilizer from a plant at Avonmouth near Bristol. This work was done of behalf behalf of W.H. Holmes of Garstang for delivery to their storage facility at Winmarleigh in Lancashire which was quite a regular job for Riding's at the time. 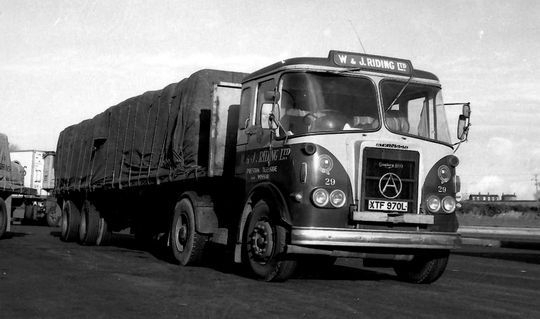 W..H. Holmes later became Safeguard Storage who themselves were eventually taken over by TDG Ltd.
Atkinson Borderer 4X2 tractor unit Reg No MVD 513L Fleet No 60 'Inflexible' was another of the ten Atkinson tractor unit's that Tom Riding purchased second hand from 'Monkland Motors' of Airdrie in Scotland. Registered new on the 7th of May 1973 it had the standard Atki specification of the time ie Cummins 220 engine in line with a Fuller 610 gearbox and group axle. As this particular one was newer than the others, being on an L plate, it cost £4,090 in March 1975. 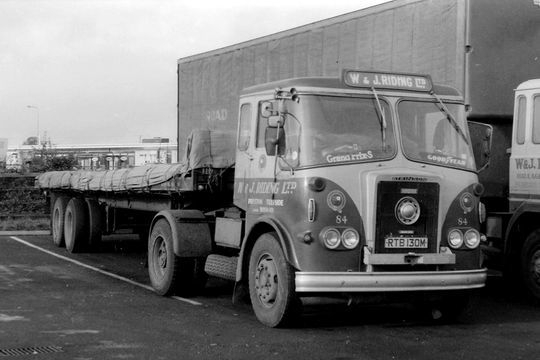 Along with the nine other Atkinson's purchased from 'Monkland Motors' it was later fitted with an in house sleeper cab. In November 1980 MVD 513L was sold on to Tom Riding's brother in law L J Ball of Dutton for £1,600 plus vat and repainted it in his yellow and grey livery at cost in Riding's paint shop. After being in service with L J Ball it was sold to John Killingbeck of Blackburn who broke it up and used it for spares. 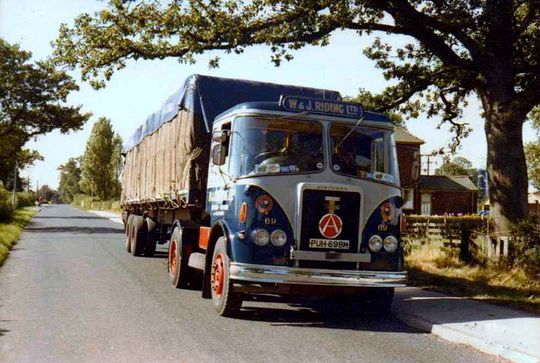 Atkinson Borderer 4x2 tractor unit Reg No XTB 850L Fleet No 18 'Leviathan' was the first Borderer fitted with a Gardner 8LXB 240 engine in line with a David Brown 8-speed range-change gearbox to enter service with Riding's in 1973. 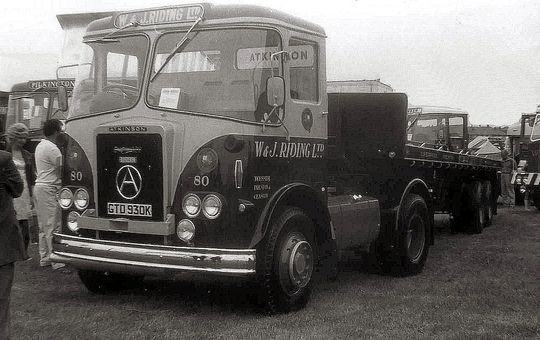 Costing £6,095.47p the photograph above was staged for Atkinson publicity purposes with XTB 850L being driven at the time by Ronnie Joyce who was employed by Atkinson to do all their demonstration driving. When joining the fleet it was driven from new by Tony Freeman who spent most of his career with W & J Riding eventually finishing up as shift foreman. Pictured above coupled to one of Riding's 'Bulk Haulage' powder tankers XTB 850L never actually pulled tankers during it's working life as it was assigned to the general haulage fleet. Another Atkinson publicity shot of Atkinson Borderer 4X2 tractor unit Reg No XTB 850L Fleet No 18 'Leviathan'. Powered by an eight cylinder Gardner 8LXB 240 engine, in line with a David Brown 8-speed range-change gearbox, it was a brand new addition to the W &J Riding fleet in 1973 at cost of £6,095 47p. On entering service XTB 850L was driven from new by Tony Freeman who spent most of his career with W & J Riding eventually finishing up as shift foreman. Atkinson Borderer 4x2 tractor unit Reg No XTB 850L Fleet No 18 'Leviathan' is seen here a few years later in 1976, at Fleetwood, while taking part in the annual Lorry Driver of the Year completion. It is coupled to an empty 35 foot tandem axle Municipal coil carrier which was one of about thirty that Riding's operated at that time. 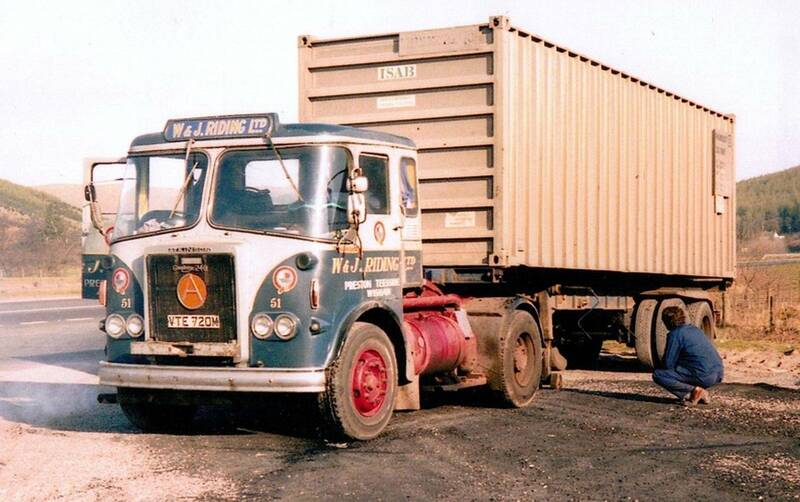 Atkinson Borderer 4x2 tractor unit Reg No RTJ 640M Fleet No 4 'Unapproachable' was powered by a Gardner 240 engine in line with an eight speed range change David Brown gearbox and Kirkstall D85 hub reduction axle. Registered new by Riding's on the 1st of December 1973 at a cost of £7,665.50p plus vat it was driven from new by Ted Bamber and spent its life running daily between Lancashire and the North East. In June 1983, after ten years service, RTJ 640M was withdrawn broken up and scrapped but it is more than likely that, today, the reliable Gardner engine is still powering a junk somewhere in Hong Kong harbour. 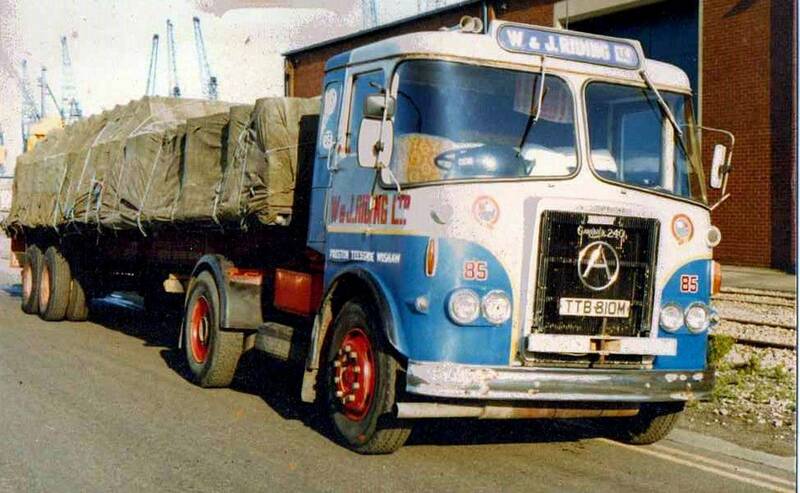 Another shot of Atkinson Borderer 4x2 tractor unit Reg No RTJ 640M Fleet No 4 'Unapproachable'. Seen here in later life now sporting the new lighter blue paintwork along with the lettering changed from gold to red this had, by this time, become Riding's standard livery. Photograph courtesy of the late Michael Deuchars. Atkinson Borderer 4x2 tractor unit Reg No STF 852M Fleet No 71 'Patriot' was originally new to Pandoro of Fleetwood on the 8th of January 1974. It was bought by Riding's second hand through Tom Riding's agent R J & I Wells along with the three other tractor units, listed below, on the 31st of January 1977 for £4,550 plus VAT. All were eventually fitted with a Riding's in house sleeper cab conversion and all were powered by Cummins 220 engines in line with a 6 speed Brown gearbox and the group axle. Atkinson Borderer 4x2 tractor unit Reg No UTB 277M Fleet No 36 'Coeur-de-Lion' was another of the batch purchased second hand by Riding's in January 1977. Originally new to Pandoro of Fleetwood in January 1974 it was purchased second hand through Tom Riding's agent R J & I Wells on the 31st of January 1978 along with three others at a cost of £4,550 each plus vat..
On arrival at Riding's it was soon fitted with an in house sleeper cab conversion for it's long distance days down the road. "I purchased it second hand through my agent R J & I Wells on the 31st of January 1978 along with three others at a cost of £4,550 each plus vat. Before joining the fleet we fitted it with an in house sleeper conversion but they would have been better units if they had been fitted with power steering". Atkinson Borderer Reg No RWW 144M Fleet No 25 'Flamboyant' was originally registered new on the 1st of April 1974. Fitted with a Cummins 220 engine in line with a Fuller 610 gearbox it was supplied from Syd Hartley on the 31st of October 1975 at a cost of £3,600 plus vat. 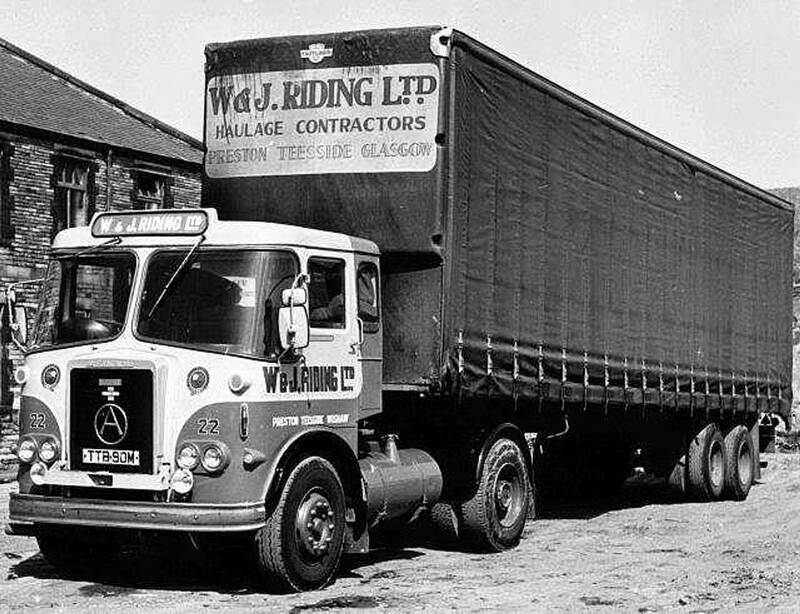 It is seen here in the livery of Bailee Freight Services of Yarm to whom it was on hire from W & J Riding. Bailee built up a good business and opened a depot at Heysham harbour to move fertiliser to Ireland with Riding's also hiring them around 30 trailers at the time. When Tom Riding asked the late Mr Ken Potts, a founding director of the company, what livery did he wish to display on the vehicles he immediately said the colours of Leeds United Football Club. After coming off hire to Bailee Freight Services of Yarm Atkinson Borderer Reg No RWW 144M Fleet No 25 'Flamboyant' was brought in to the workshop at Longridge, fitted with an in house sleeper cab and repainted back into the familiar Riding livery. Assigned to the general haulage fleet it remained in service for a number of years until, on the 9th of June 1981, it was finally sold on to a Mr John Lowes of Newcastle on Tyne for the sum of £1,700 plus vat. 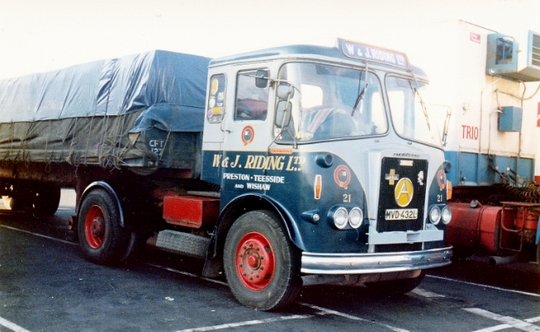 Atkinson Borderer 4x2 tractor unit Reg No OTF 550M Fleet No 81 'Robust', powered by a Cummins NH250 engine, was registered new on the 1st of September 1973 and later had one of Riding's own sleeper conversion kits fitted. After life at Riding's OTF 550M was sold on to another local operator by the name of J. Canning of Leyland. When Canning's ceased trading OTF 550M later passed into the hands of Kevin Dennis and into preservation in Norfolk. 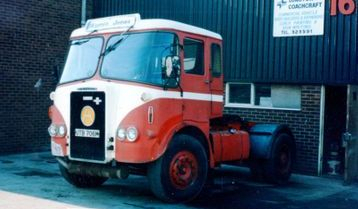 Registered new on the 5th of October 1973 Atkinson Borderer 4x2 tractor unit Reg No RTB 130M Fleet No 84 'Resolute', powered by Cummins 250 engine, was one of a batch of seven Atkinson's introduced into the fleet that year. 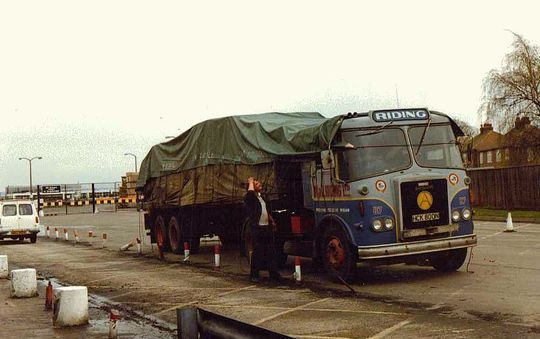 Pictured here at North Canada Docks in Liverpool, while waiting to unload, the vehicle was in the second phase of it's life after receiving an in house sleeper cab conversion. 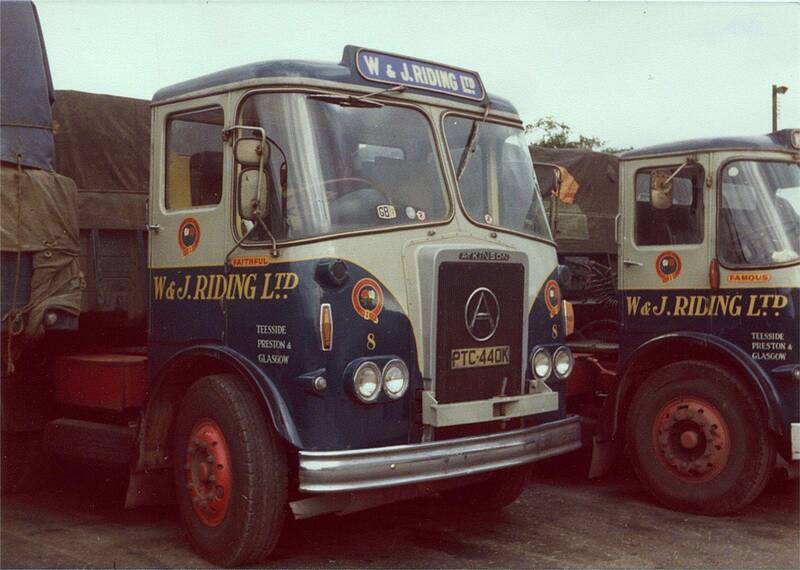 Photograph courtesy of renowned lorry photographer Peter J Davies. Another shot of Atkinson Borderer 4x2 tractor unit Reg No RTB 130M Fleet No 84 'Resolute'. Powered by Cummins 250 engine it was registered new on the 5th of October 1973 it was one of a batch of seven Cummins powered Atkinson's introduced into Riding's fleet that year. 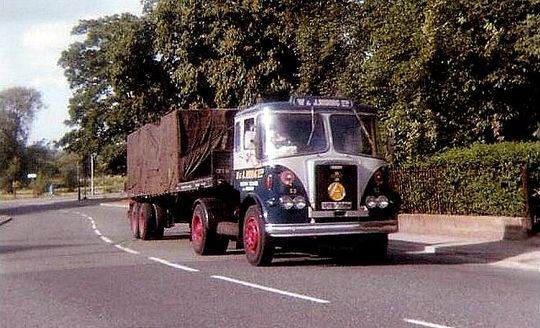 Atkinson Borderer 4x2 tractor unit Reg No PTJ 120M Fleet No 83 'Forceful' was powered by a Gardner 240 eight cylinder engine in line with a David Brown eight speed gearbox and Kirkstall D 85 axle. Registered new by Riding's on the 1st of October 1973, at a cost of £7,660.50 plus vat, it is pictured here in the depot while loaded with forty gallon drums of Cereclor (chlorinated paraffin) from the ICI plant at Hillhouse. Harry Dinsdale, who spent all his working life at W.J Riding, was its first driver and it was permanently assigned to the general haulage fleet. After ten years service PTJ 120M was scrapped on the 31st of March 1983 and the engine was sold on to Hartwood Exports of Barnsley for £3,000 plus vat. 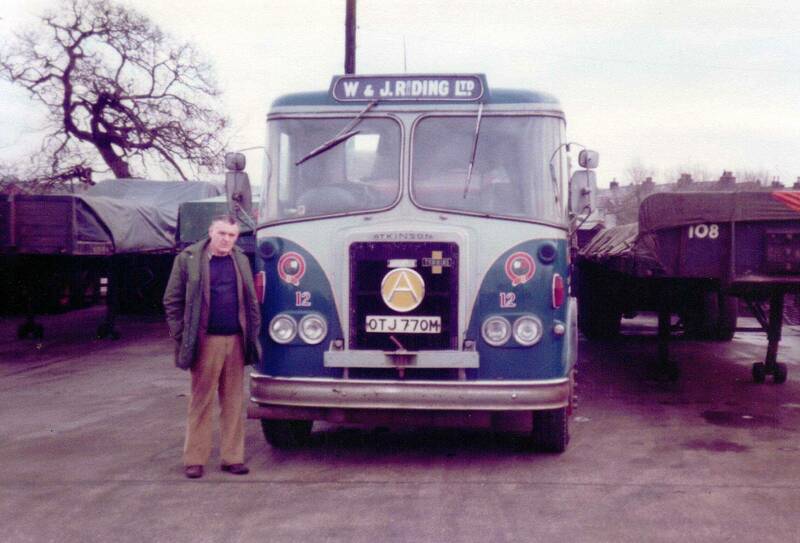 Tom Riding is pictured above stood next to Atkinson Borderer Reg No OTJ 770M Fleet No 12 'Resourceful' which was registered new on the 1st of September 1973 at a cost of £7,047.75. plus vat. 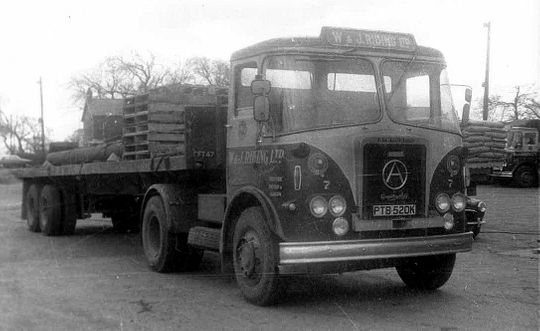 This tractor unit was one of a batch of seven Cummins powered Atkinson's that Tom Riding bought when Gardner could not supply any eight cylinder engines at the time. Powered by a 250 Cummins engine in line with a Fuller gearbox and D85 hub reduction Kirkstall rear axle it also had ZF power steering fitted. 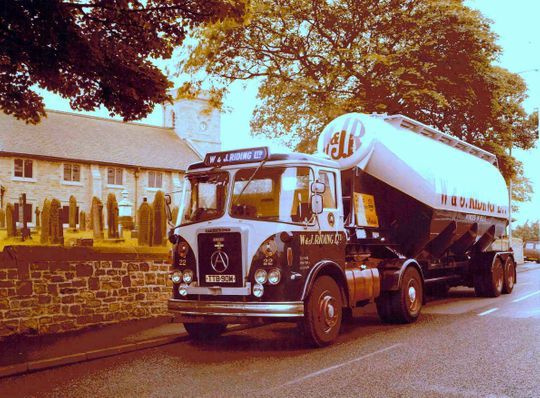 It was driven from new by John Elliott who was eventually promoted to depot manager at Motherwell. "I was in the yard one Saturday afternoon when the late Michael Deuchars who was taking some pictures asked if he could take one of me, always one to please, i happened to stand in front of OTJ 770M. I later sold it on to a Mr T Taylor of Darwen on the 26th of February 1983 for £1,175 plus vat after it had been in service with us for almost 10 years". Atkinson Borderer 4x2 tractor unit Reg No PUH 698M Fleet No 69 'Paramount' was powered by a Cummins 220 engine and was registered new on the 13th of November 1973. "Bought second hand for £3,000 plus vat when three years old i remember at the time i took this photograph we had just fitted it with one of our sleeper cab conversion's, and with a lovely straight nicely sheeted load i decided to take it for a run and take a photo or two. 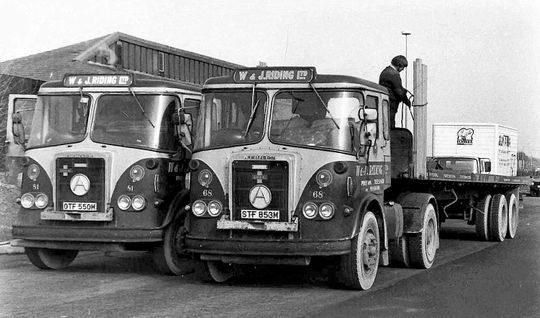 Notice that in those days, unlike today, trailers had no mudguards or spray suppression equipment fitted"
Another shot of Atkinson Borderer 4x2 tractor unit Reg No PUH 698M Fleet No 69 'Paramount' which was powered by a Cummins 220 engine. Purchased second hand from R.J. & I Wells for £3,600 plus vat on the 8th of February 1977 it had been previously owned by a large local contractor, George Noblet Plant Ltd, who had bought it new in November 1973. 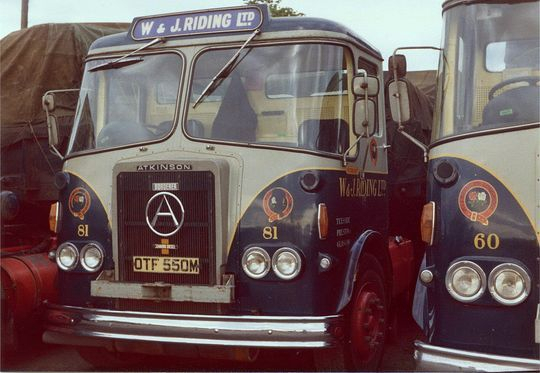 After joining the Riding fleet in 1977 it remained in service for four years until July 1981 after which time it was sold on to a Mr Taylor of Darwen for £650 plus vat. Atkinson Borderer 4x2 tractor unit Reg No STF 710M Fleet No 50 'Glorious'. This particular Atkinson Borderer was fitted with a Gardner 240 eight cylinder engine in line with a David Brown eight speed gearbox and Kirkstall D85 hub reduction axle. Registered new by Riding's on the 1st of January 1974, at a cost of £7,947.50 plus vat, it was driven from new by long serving Riding's man Jack Moon.
" This was the first unit to be fitted with a sleeper cab extension by W H Fowler of Leyland. You can just see the joining where they have extended the roof, so we thought we could do a better job in house using a new one piece roof and all subsequent conversions were done this way". After nine years service STF 710M was sold on to John Killingbeck of Blackburn on the 30th of June 1983 for £3,000 plus vat who used it for spares such as radiator, engine and gearbox. Atkinson Borderer 4x2 tractor unit Reg No TTB 90M Fleet No 22 was registered new on the 1st of February 1974 at a cost of £6,984.75p and was one of a batch of seven Cummins powered Atkinson's that Riding's bought due to Gardner being unable to supply their popular eight cylinder engine at the time. 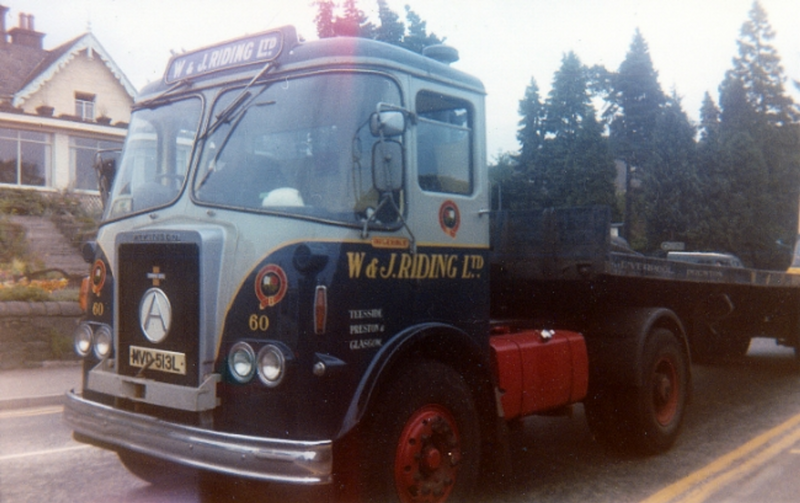 Tom Riding's friend, the late Tom Bennett who was sales manager at the company, persuaded Tom into buying seven other 4x2 tractor units similar to this one. All were fitted with Cummins 250 engines in line with David Brown 8 speed range change gearbox and the Kirkstall D 85 hub reduction axle with the only bit of foreign stuff on the vehicle being the ZF power steering. They gave a very good account of themselves although one weakness was the inherent faults with the David Brown box. After nine years service It was finally sold on to a Mr Taylor of Darwen for £1,575 plus vat on the 21st of February 1983. Another shot of Atkinson Borderer 4x2 tractor unit Reg No TTB 90M Fleet No 22 this time seen hauling a tandem axle curtain-sider trailer which was what it normally did. 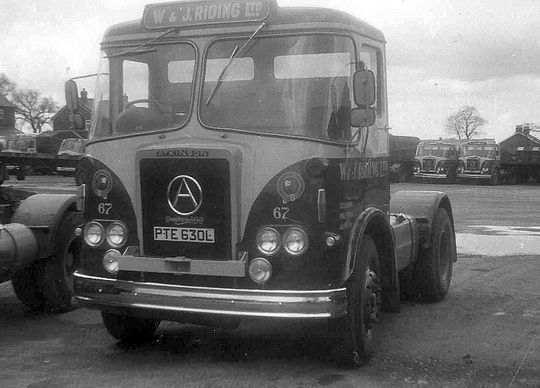 Registered new on the 1st of February 1974 at a cost of £6,984.75p it was one of a batch of seven Cummins powered Atkinson's that Riding's bought due to Gardner being unable to supply their eight cylinder engine at the time. Norman Holland, who lived in Darwen, drove TTB 90M from new and after nine years service it was finally sold on to a Mr Taylor of Darwen for £1,575 plus vat on the 21st of February 1983. 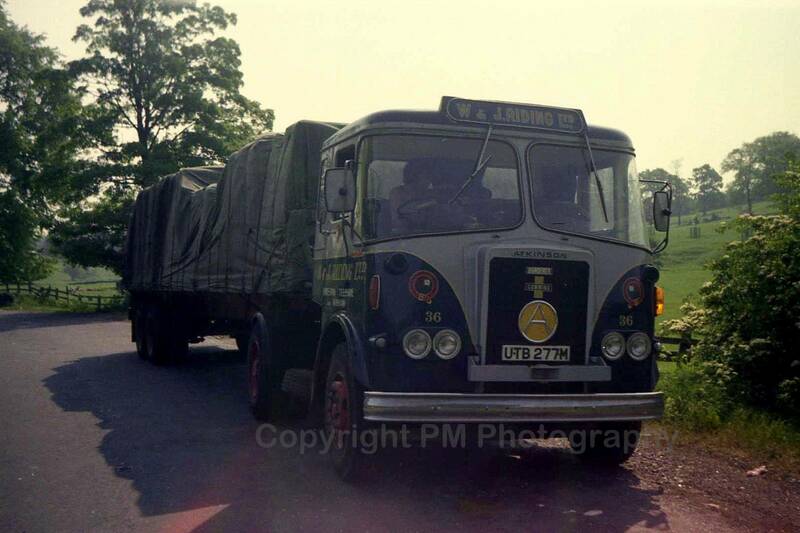 Atkinson Borderer 4x2 tractor unit Reg No TTB 810M Fleet No 85 'Superb' was registered new by Riding's on the 1st of February 1974 at a cost of £7,892.50p plus vat. Powered by a Gardner eight cylinder engine, in line with an eight speed David Brown box and D85 Kirkstall hub reduction axle, it was driven from new by Bill Lambert and is seen here prior to washing off after returning to the depot in a filthy condition. 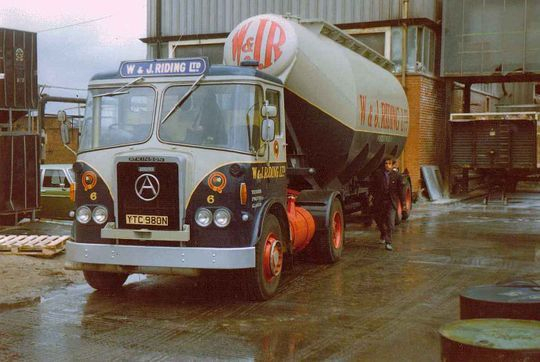 Note the AEC 90 gallon fuel tank that was fitted in Riding's own workshops to increase the Atki's range of travel. 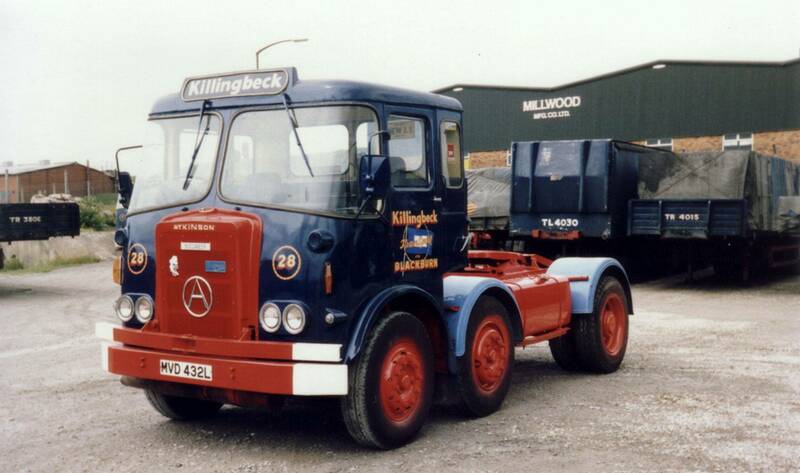 On the 3rd of August 1983, after nine and a half years service with Riding's, TTB 810M was sold on to John Killingbeck of Blackburn for £3,300 plus vat. Another shot of Atkinson Borderer 4x2 tractor unit Reg No TTB 810M Fleet No 85 'Superb' seen here in a nice clean condition. Registered new by Riding's on the 1st of February 1974 at a cost of £7,892.50p plus vat it was driven from new by Bill Lambert. 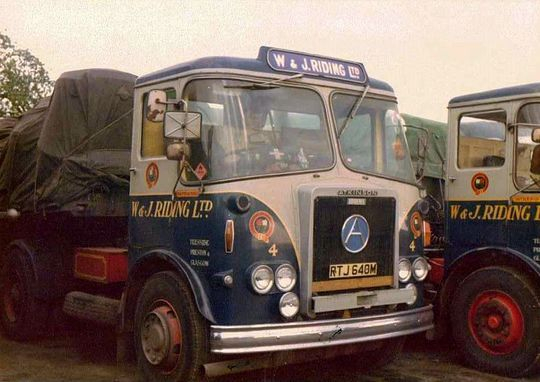 These two Atkinson Borderer's were coming to the end of their working lives at W & J Riding when the picture was taken, probably in the late seventies - early eighties. Reg No OTF 550M Fleet No 51 'Robust' was new to Riding's and STF 853M Fleet No 68 'Britannia' was a second-hand, purchase from Pandoro. Both had received in-house sleeper conversions and being Cummins-powered would have been high on the disposals list. 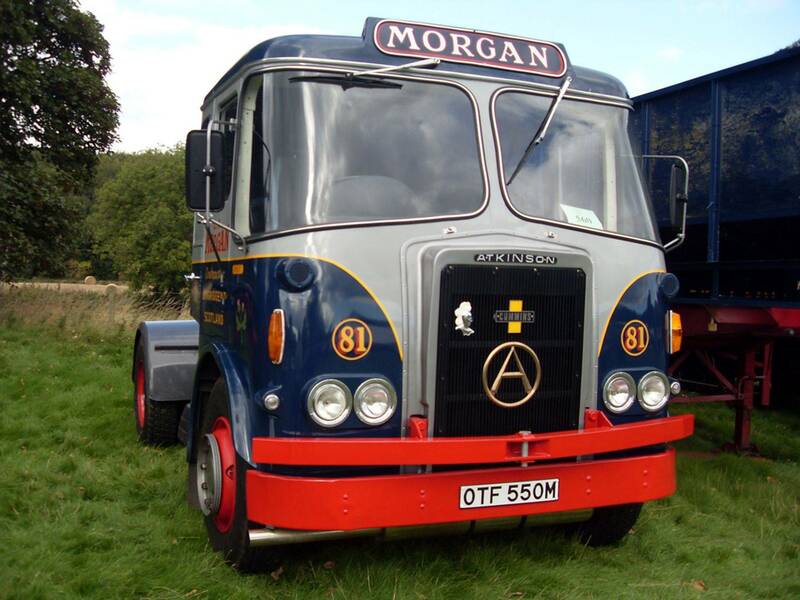 OTF 550M was sold on to J Canning of Leyland and later survived into the ownership of well-known preservationist Kevin Dennis. 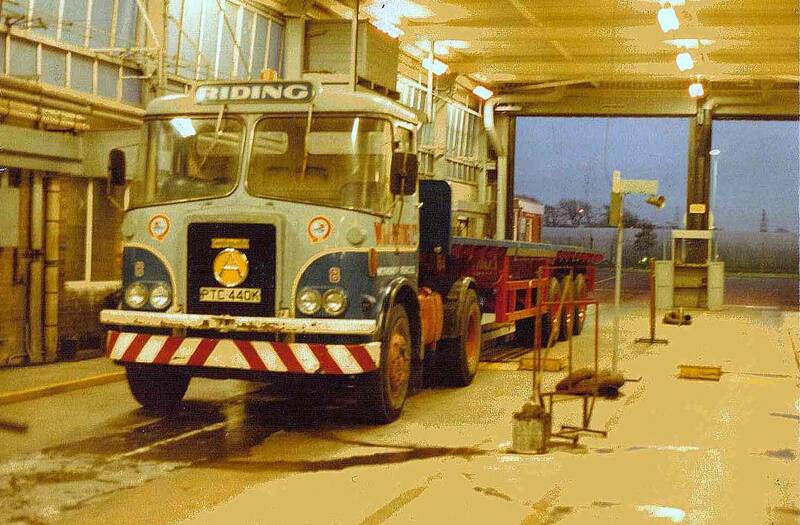 STF 853M was sold on to Norman Billington's of Heysham who ceased trading shortly before it was set to work. Atkinson Borderer Reg No STJ 670M Fleet No 70 'Dynamic' was powered by a Cummins 250 engine and was registered new on the 1st of February 1974 at a cost of £6,979. Driven from new by Rodney Preston Cummins retro fitted this engine with a turbo charger to do extended mileage trials and eventually marketed this set up and called the engine the 240T. Atkinson Borderer Reg No HCK 800N Fleet No 87 'Supreme' was powered by a Gardner 8 cylinder 240hp engine. Registered new on the 1st of December 1974 at a cost of £9,390 it was driven from new by Rex Rich another long term Riding's man. Both vehicles were fitted with David Brown 8 speed gearboxes. They are shown here heading south from the British Steel Corporation Motherwell plant loaded with the usual steel plates of which Riding's moved large tonnages of at the time. A colour shot of Atkinson Borderer Reg No STJ 670M Fleet No 70 'Dynamic pictured in the depot at Longridge. Powered by a Cummins 250 engine this tractor unit was registered new to Riding's on the 1st of February 1974 at a cost of £6,979. Driven from new by Rodney Preston the Cummins engine was retro fitted with a turbo charger for extended mileage trials. After these trials Cummins eventually marketed the engine as the 240T. Photograph courtesy of Steve Richardson. 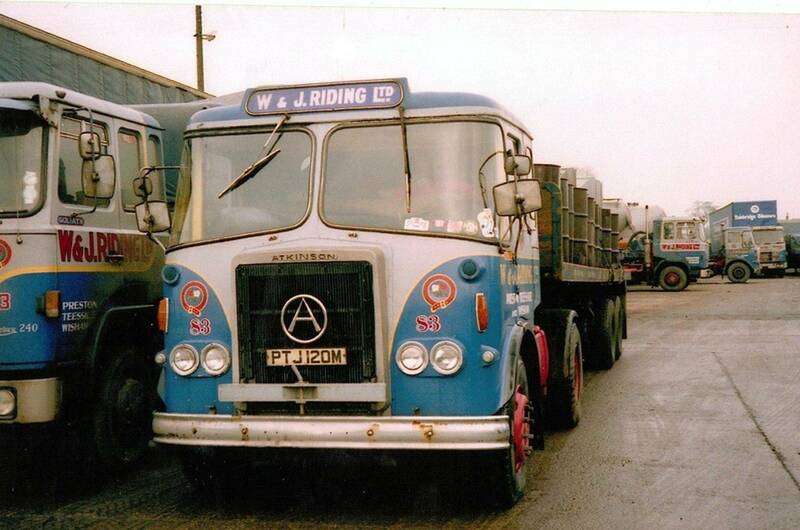 Atkinson Borderer 4X2 tractor unit Reg No UTC 900M Fleet No 48 'Dominant' was registered new to Riding's on the 1st of April 1974 at a cost of £8,051 plus vat. This tractor unit was fitted with the legendary set up of a Gardner 240 engine in line with a David Brown 8 speed gearbox and a Kirkstall D 85 rear axle. During its life it was fitted with a sleeper cab extension in Riding's own workshops also fitted with a larger than standard fuel tank which was of AEC manufacture. Originally allocated when new to the late Derek Finch it later spent a few years with driver Tommy Wearing who chased it up and down to the North East. 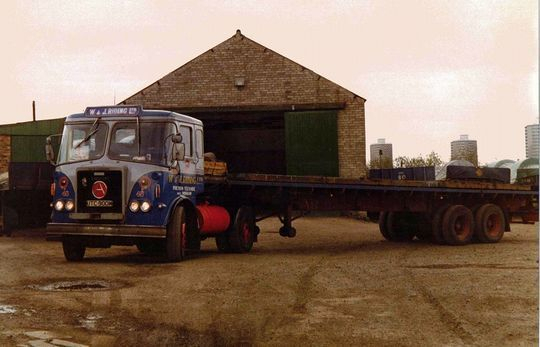 Alan Dixon, who was driving it at the time, took this photo at Riding's original old depot at Wishaw in Scotland were it is seen coupled to one of Riding's standard forty foot tandem axle trailer's loaded with steel slabs. The photo must have been taken in the winter months as the chrome bumper is suitably covered in grease to prevent it rusting, a procedure the late Jim Riding used to do religiously every winter. 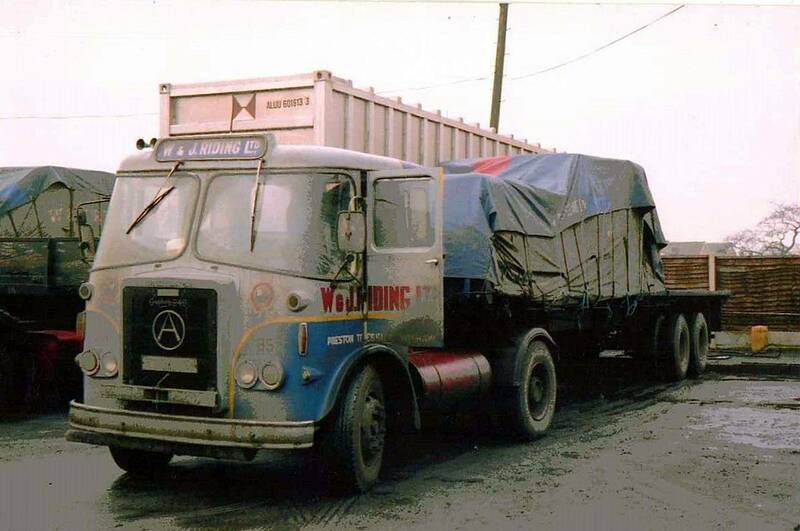 Atkinson Borderer 4x2 tractor unit Reg No VTE 720M Fleet No 51 'Superior' is pictured here next to the old A74 at Beatock in Scotland whilst pulling a 30 foot skeletal trailer. Powered by a Gardner 240 eight cylinder engine, in line with a David Brown 8 speed gearbox and D 85 Kirkstall hub reduction axle, it was registered new by Riding's on the 1st of June 1974 at a cost of £8,051.50p plus vat. Based at Riding's Teesside depot it was fitted with a compressor and was used for powder tank deliveries on behalf of ICI Ltd with Jimmy Lever it's original driver. In April 1983, after nine years service, it was broken up and scrapped with it's Gardner engine sold on to Hartwood Exports for £3,000 plus vat. Atkinson Borderer 4x2 tractor unit Reg No VTJ 480M Fleet No 2 'Heroic' was registered new by Riding's on the 14th of June 1974 at a cost of £8,636.77p plus vat. Powered by a Gardner 8LXB 240 engine in line with an eight speed David Brown gearbox and Kirkstall D85 axle it was driven from new by the late George Cavagan. Out based at Penrith it was double shifted and used on the Scottish traffic all its life. On the 30th of June 1983, after nine years service, it was sold on to John Killingbeck of Blackburn for £3,500 plus vat. Atkinson Borderer 4x2 tractor unit Reg No YTB 540N Fleet No 43 'Able' was powered by a Gardner 180 engine in line with a David Brown six speed box and Kirkstall D85 hub reduction rear axle. 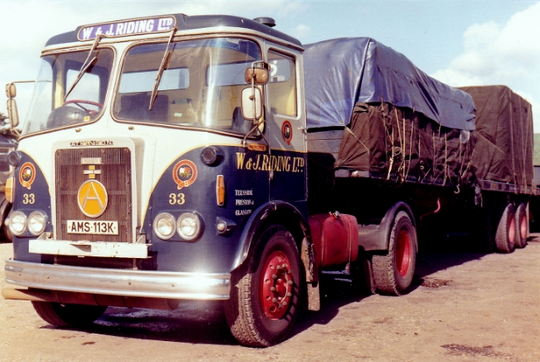 Registered new to Riding's on the 1st of September 1974, at a cost of £8,034 plus vat, it was driven from new by the late Richard Walton who spent all his working life driving for the company. It is pictured here coupled to a Crane Fruehauf 40 foot trailer but spent a great part of its life pulling a Crane Fruehauf 1450 cubic foot non tipping powder tank on the ICI Ltd PVC contract. Notice the 90 gallon fuel tank, made by Jolleys of Preston, which enabled it to get to the South Coast and back with fuel to spare. After 12 years service in the fleet YTB 540N was eventually sold as scrap with no engine to Translitre of Burton on Trent for £500 plus vat on the 21st of April 1986. Atkinson Borderer 4x2 tractor unit Reg No YTC 980N Fleet No 6 'Eminent' was another brand new addition to the fleet in 1974. Registered new on the 1st of September at a cost of £8,134.33p plus vat it came with the usual spec at the time of a Gardner 180 engine in line with a six speed David Brown gear box and Kirkstall D 85 hub reduction rear axle. Driven from new by Arthur Luke it is seen here while discharging a 1450 cubic foot non tipping tank at the Welvic plant of ICI Ltd Hillhouse Works at Thornton Blackpool. After nine years service YTC 980N was sold on the 23rd of July 1983 for £1,200 plus vat to W & G Taylor of Skipton. "It went on to be used with a tipping trailer, and knowing William as I did at the time, it would really start to work as never before"
Another shot of Atkinson Borderer 4x2 tractor unit Reg No YTC 980N Fleet No 6 'Eminent' seen here towards the end of it's working life at Riding's in 1982. After being in service with Riding's for nine years YTC 980N was sold on the 23rd of July 1983 for £1,200 plus vat to W & G Taylor of Skipton. Atkinson Borderer's as far as the eye can see! Click on picture above to view full size. 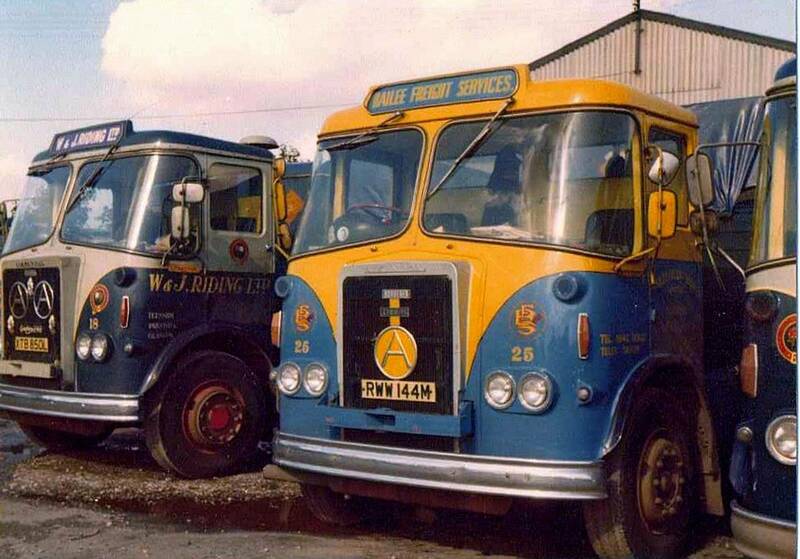 This impressive line up of Atkinson Borderer 4x2 tractor units are pictured parked up for the weekend around 1980 in the depot at Longridge. These were the days when Riding's immaculate fleet was dominated by the Atkinson marque, which were built locally just down the road at Walton-le-Dale near Preston. Atkinson Borderer Reg No HCK 800N Fleet No 87 'Supreme' was powered by a Gardner 8 cylinder 240 bhp engine. Registered new on the 1st of December 1974, at a cost of £9,390, it was normally driven by Rex Rich who was a long term Riding's man. In this particular picture, taken towards the end of it's working life, it is being driven by John White who appears to be larking about shown here sheeting up the tractor unit as well as the load. The location is outside Heinz's Kitt Green factory near Wigan where John had just loaded 20 tons canned goods. Atkinson Borderer 4x2 tractor unit Reg No GRN 137N Fleet No 86 'Splendid' was registered new by Riding's on the 1st of November 1974 at a cost of £9,415.21p + vat. Powered by a Gardner 240 engine it unfortunately caught fire in August 1981 while climbing the long assent on the M62 between Junctions 21 and 22 near Rochdale. The cause of the fire was due to sound insulation material dropping on to the hot exhaust manifold resulting in the vehicle being totally burnt out and warping the chassis. 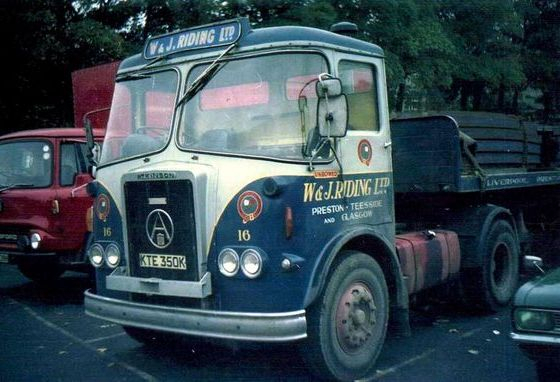 "Originally our Atkinson Borderer 4x2 tractor unit Reg No GRN 137N Fleet No 86 'Splendid' was registered new by us on the 1st of November 1974 at a cost of £9,415.21p plus vat. Powered by a Gardner 240 engine it unfortunately caught fire in 1981 while climbing the long assent on the M62 between Junctions 21 and 22 near Rochdale. The fire was caused by sound insulation material dropping on to the hot exhaust manifold resulting in the vehicle being totally burnt out and warping the chassis. 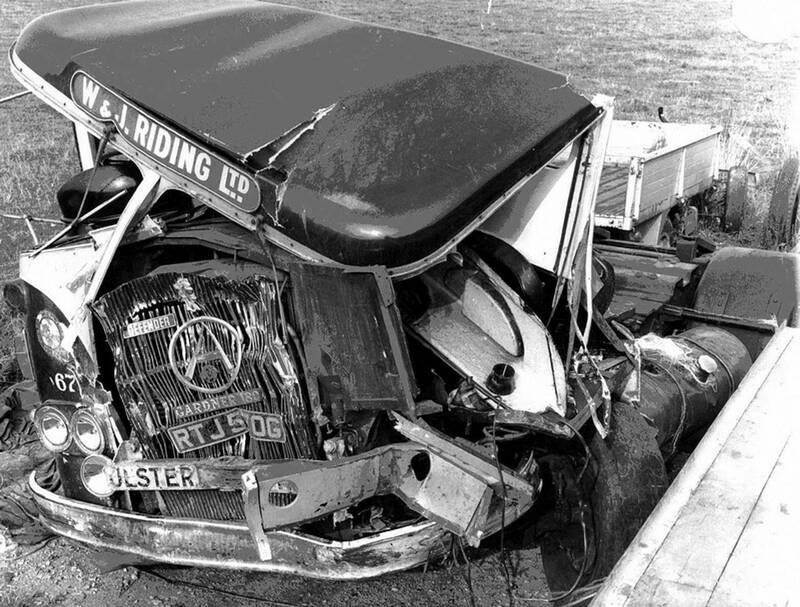 To all intents and purposes it should have been scrapped except that the engine and running units only suffered superficial damage and were repairable. I looked around and discovered that D & F Services of Bamber Bridge, who i had used for years, had in fact a rolling chassis, minus the cab, identical to the warped one i needed to replace. This chassis turned out to be ex Suttons 4x2 tractor unit Reg No JTB 888P which had been registered new to Suttons on the 13th of November 1975 making it virtually one of the last Atkinson Borderer's before the launch of the '400 Series' hence the late 'P' registration plate. I duly bought it complete with its logbook and using parts we had about us at Longridge, including a spare cab, it was rebuilt for a total of £3,765 and put back into service as Fleet No 25 named 'Bright Star'. After three years service with us i then sold it on to John Killingbeck of Blackburn for £3,000 plus vat in February 1984. My Lords Ladies and Gentlemen this is the true record and the true story regarding Atkinson Borderer Reg No JTB 888P. 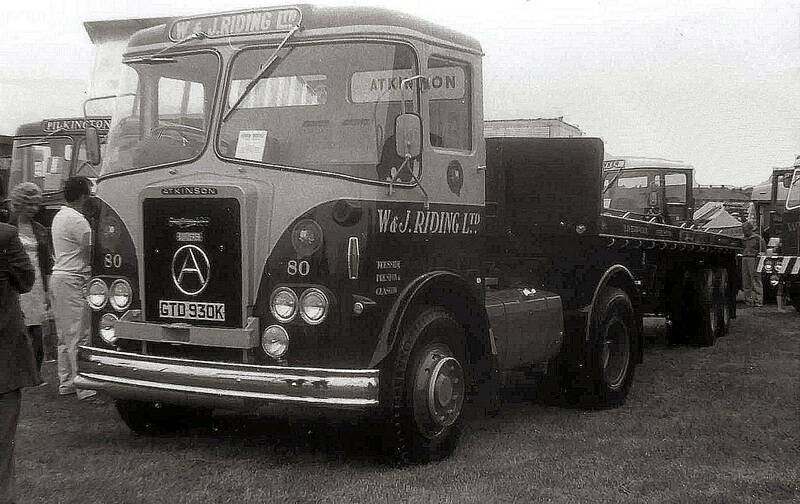 We just loved to bugger about with Atkinson's".